Here are 5 abdominal bodyweight exercises – part of my ‘Top 20 Bodyweight Exercises’ post. Everyone wants a nice set of abs don’t they? Well with these exercises will primarily work your abdominal muscles. As you are aware of already (If you’re my subscriber you should defiantly know) if you want to get nice flat abs you need to be working the whole body out. So combing these exercises with some upper body, lower body and whole body exercises is a must. This one could probably go into the whole body exercise list, but it’s a great one for your abs IF you do it properly. Begin in standard push up position. Brace your abs, and bring your right knee in towards your chest – without letting you bum raise or drop. Bring you right knee back to it starting position, and do the same with the left leg. Then keep alternating between each leg. This exercise can do wonders for the abs. I recently put it in as part of my 20-10 workout, and my abs were burning the next day. Start with your feet shoulder width apart. Raise your hands above your head. Now bring your left knee up to waste height and your right elbow down. Your right elbow should touch your left knee. Then return back to the starting position. Now do the same again, but this time raise your right knee and bring your left elbow down. Alternate between each side. Get into a standard push up position, but instead of using your hands to keep you in the upright position, you will be using your elbows. Make sure your back is straight and hold that position. Try not to have your bum to low or too high. Exactly the same as above except this time you will be facing to the side. Lie on the floor with the side of your left leg and left part of your torso touching the floor. Place your elbow down on the floor. Now lift your hips upwards and hold that position. One you have held that position for a period of time switch over and do the same thing on the other side. This one’s like peddling a bike – hence the name. Lie on your back and lift your legs off the floor. Now start to imagine you’re on a bike peddling – and do the same action. The lower your legs are the harder the exercise is. 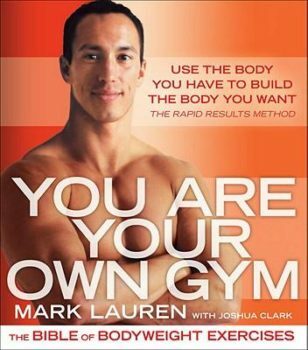 You Are Your Own Gym, by Mark Lauren gives you some of the best bodyweight exercises that you can perform in the comfort of your own home. With over 81 pages of bodyweight exercises and a fitness program to follow you really have no excuse not to exercise. Bring this book anywhere in the world and you’ll never be short of exercises. You can read my review right here on this site.